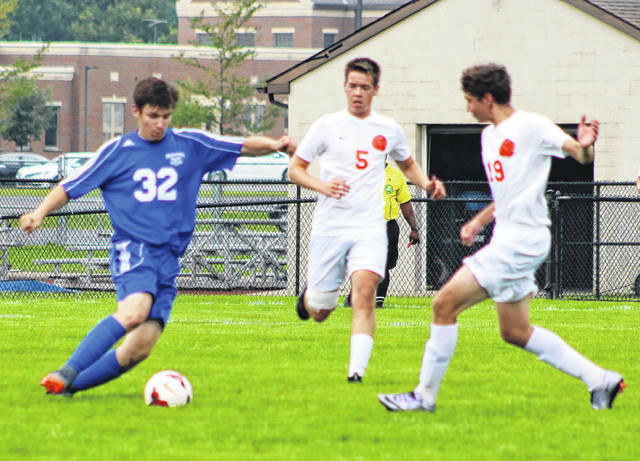 Ryan Schwartz possesses the ball for the Blue Lions during a non-conference match against Wilmington at Washington High School Saturday, Aug. 25, 2018. On a windy, and eventually wet Saturday, the Wilmington boys soccer team had their way with the hosting Blue Lions in a 10-1 victory. The Blue Lions’ goal came after Grant Kuhlwein was fouled outside the penalty area. Senior captain Nicholas Bishop coolly played the ensuing set piece over the keeper’s head into the side netting. That goal made the score 2-1, but it was all Wilmington after that. Washington (0-2-1) travels to Hillsboro for their first FAC match of the season Tuesday at 5 p.m.